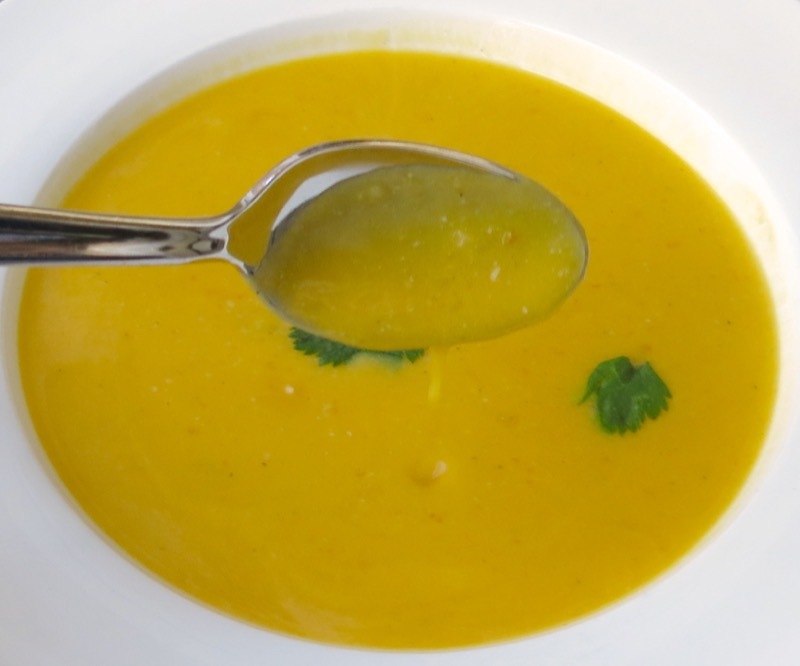 Do not underestimate how outstanding this recipe for Thai Butternut Squash Soup is! This is the best soup I have ever made. Seriously. The Porchini Chestnut Soup with Truffle Oil remains outstanding, as do others, of course, but I have conquered the complexity of these foreign-to-me Thai flavours thanks to Jenny Wijesinghe, Coach in the Kitchen who developed a Thai Flavour Pack as an alternate taste experience for our Canada West Thermomix Demonstration Recipes. 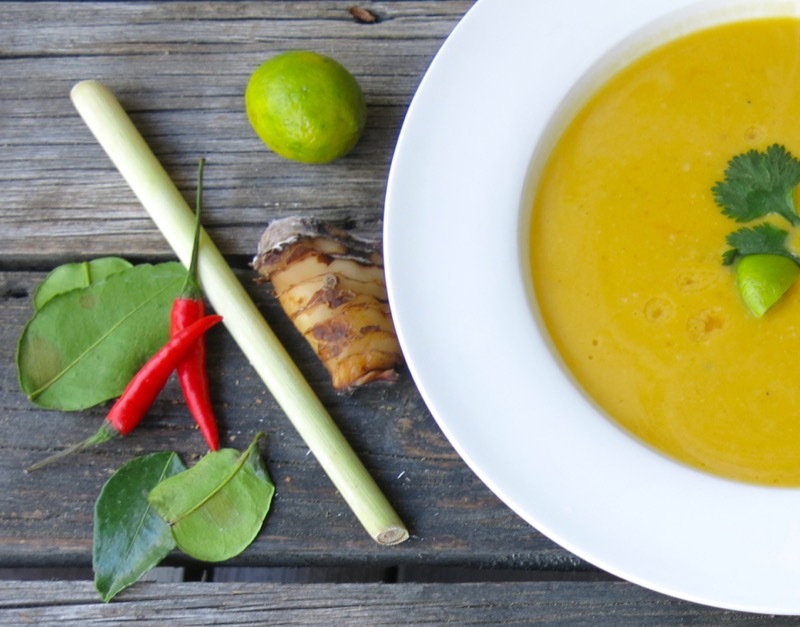 The ingredients in the Thai Flavour Pack permeate the flesh of the butternut squash and coupled with the addition of coconut milk, brings this soup to our home table directly from the far East. 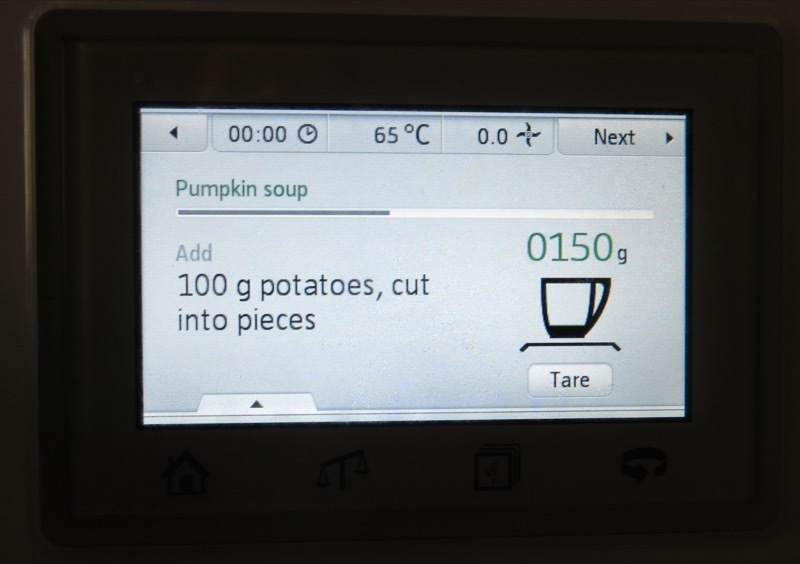 Those of you with a TM5 machine just need to turn to the Pumpkin Soup Guided recipe in your TM5 Recipe Chip and the Canadian, Australian or English Basic Cookbook, or the Butternut Squash Soup (same recipe) in the American Basic Cookbook. 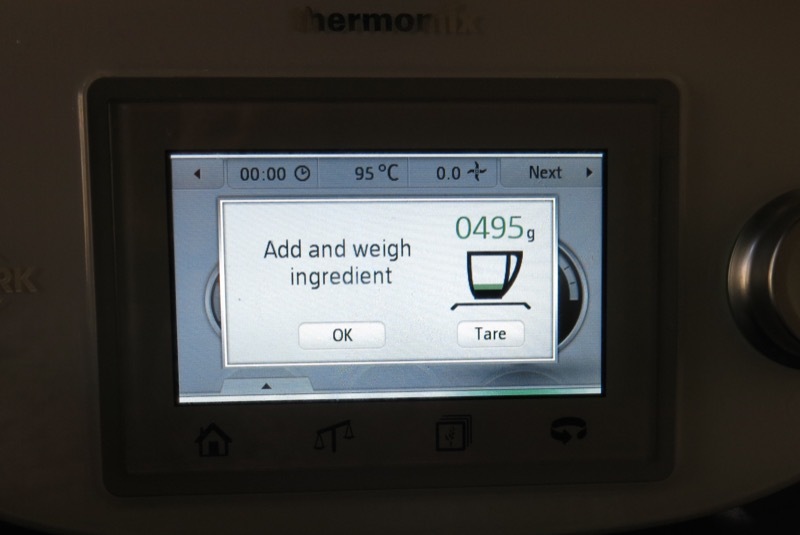 Jenny added a few alterations, and when I made it with my Thermomix Consultant Team in Edmonton, we made some simple adjustments that I am sharing with you today. 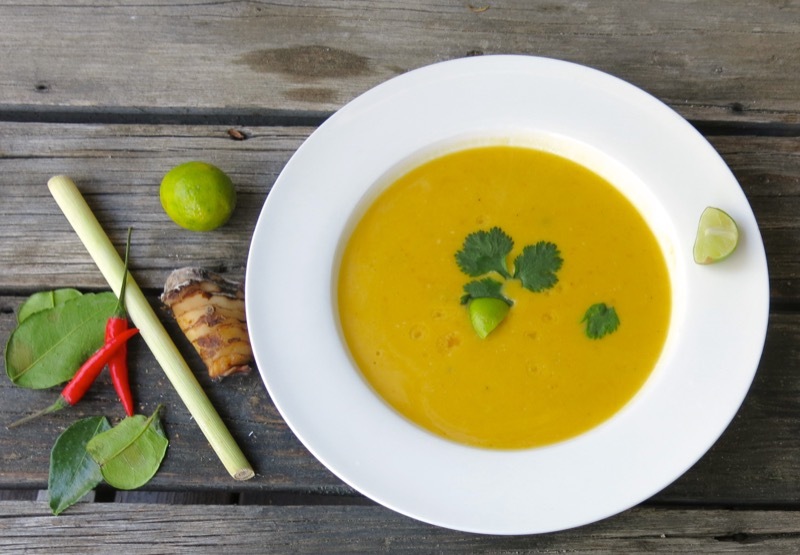 The raw cashews add such an unexpected lovely texture and flavour; the heat from the tiny Thai peppers is tempered with the addition of the coconut milk, but important, and definitely a voice in the mix. The lime leaf, lemon grass and galangal mingle together in the background and offer up a soothing snuggle teeming in aromatic wonder. 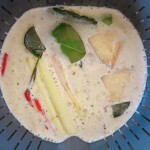 The Thai Flavour Pack is prepared, placed in the simmering basket, and set aside. 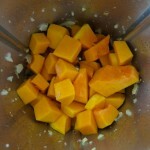 Ginger and onion chopped and sautéed; squash peeled and cut into small cubes. 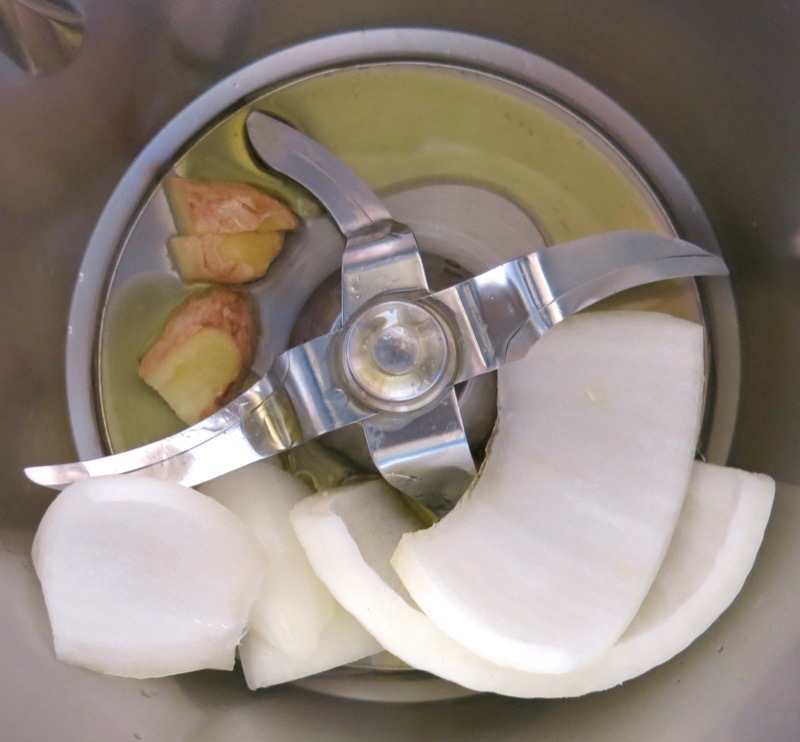 While the aromatics sauté, the TM5 can weigh the next ingredients in the Varoma on its lid. 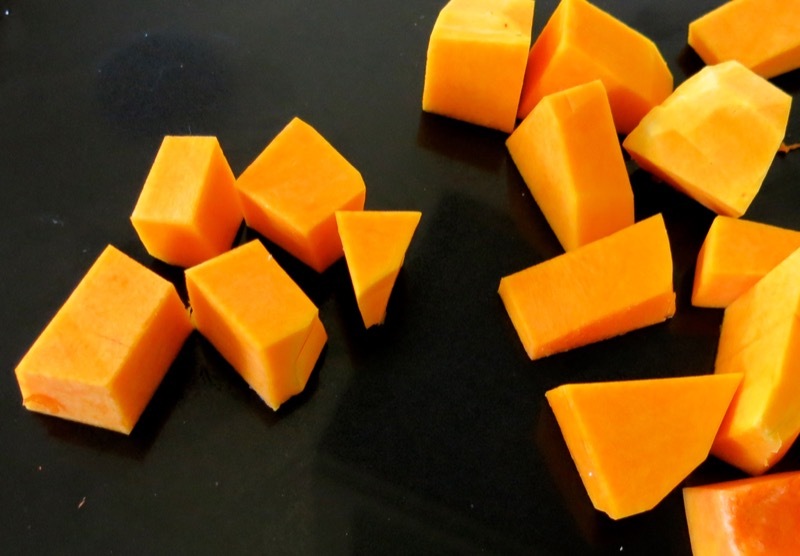 The recipe calls for 400 grams of the squash, yet half of this squash weighs 495 grams. Throw it in! This is soup, right? 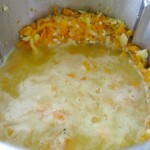 Aromatics sautéed, add squash and potato. Woops! 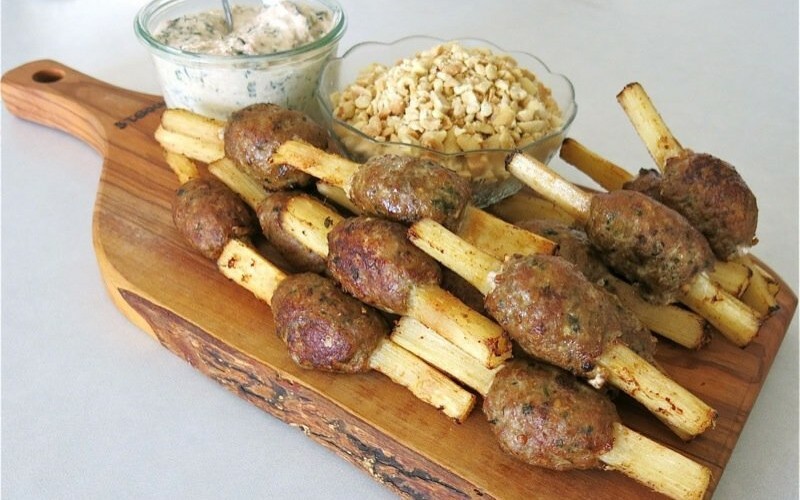 One small potato weighs 150 grams, but we only need 100 grams for the recipe! Throw it in! This is soup! 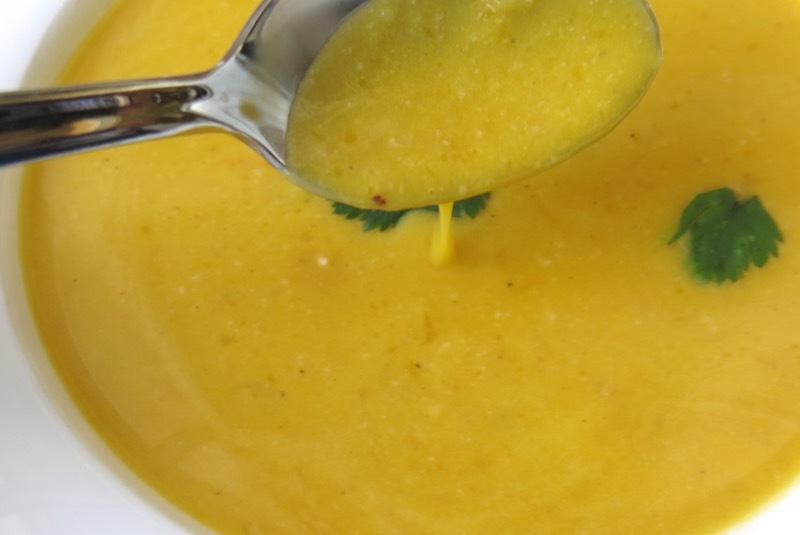 Let’s remember, soup was created to use up all of those tasty odds and ends in the kitchen. The ingredients in this bowl are a work of art, no? 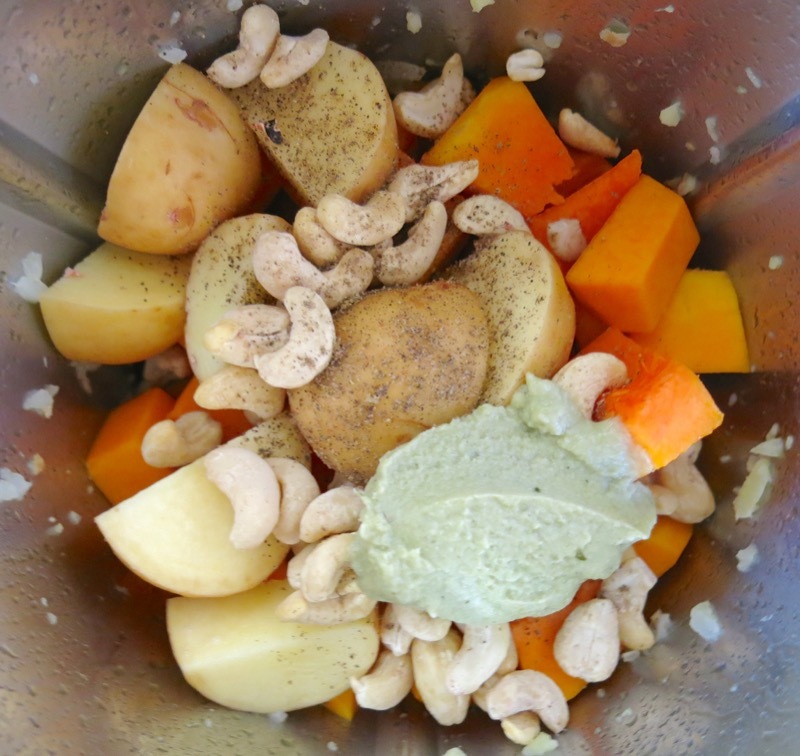 Butternut squash, potato, raw cashew nuts, and homemade chicken stalk paste! 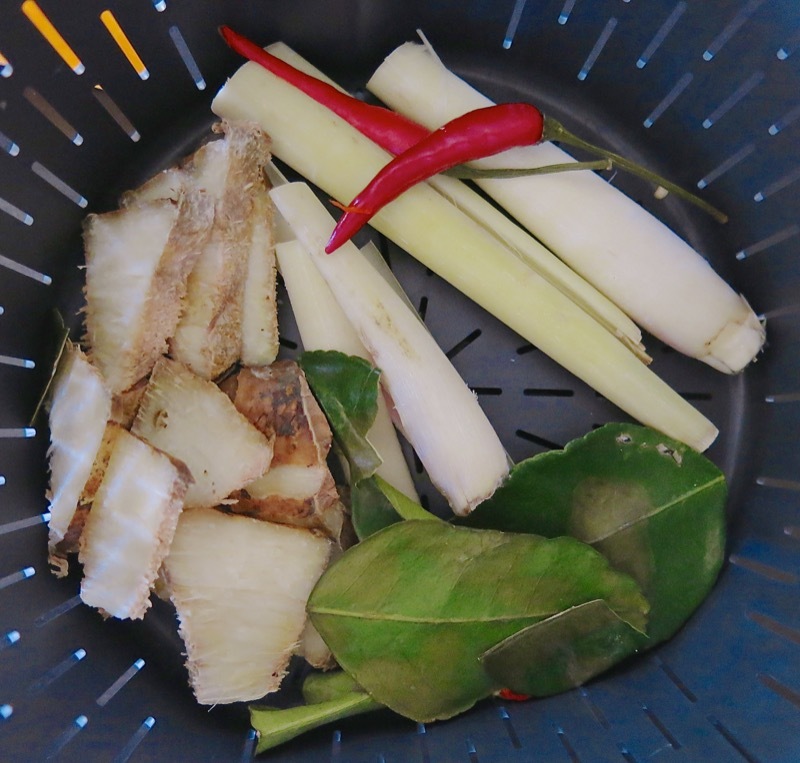 Can you imagine all this goodness, plus the sautéed aromatics combined with the Thai Flavour Pack that will simmer in the broth? 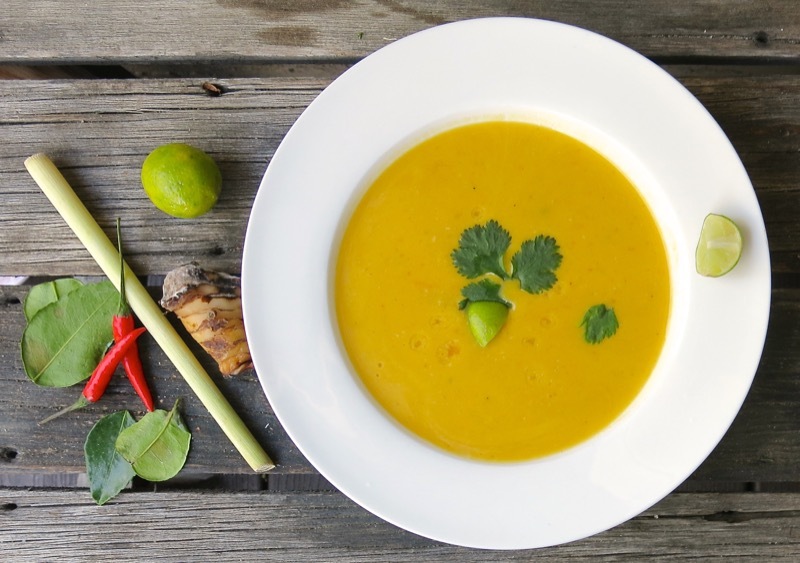 We are talking big, bold unabashed flavour and we are talking nutritious, delicious and economical food. Once the stock is added, the simmering basket will not fit into the TM bowl. 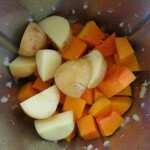 The squash and potato need to be chopped to a much finer mince which you can see in the second photo in the above series to enable the fit. 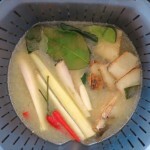 The Thai Flavour Pack is then gently pushed down into the broth inside of the simmering basket and steeped with the soup. 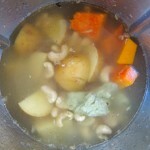 The last two photos, above, show the finished soup. 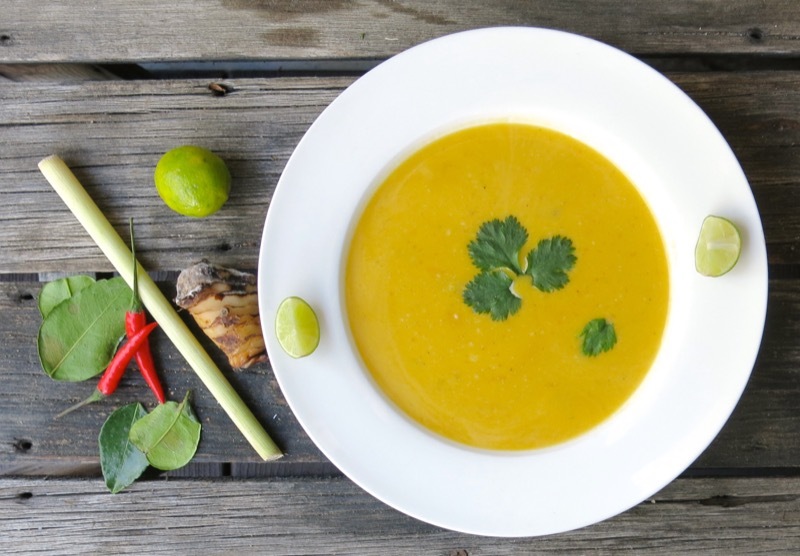 The lid has been taken off of the TM bowl and the golden orange soup has filled the simmering basket blanketing the ingredients in the Thai Flavour Pack. Quite a contrast from the uncooked photo just prior. 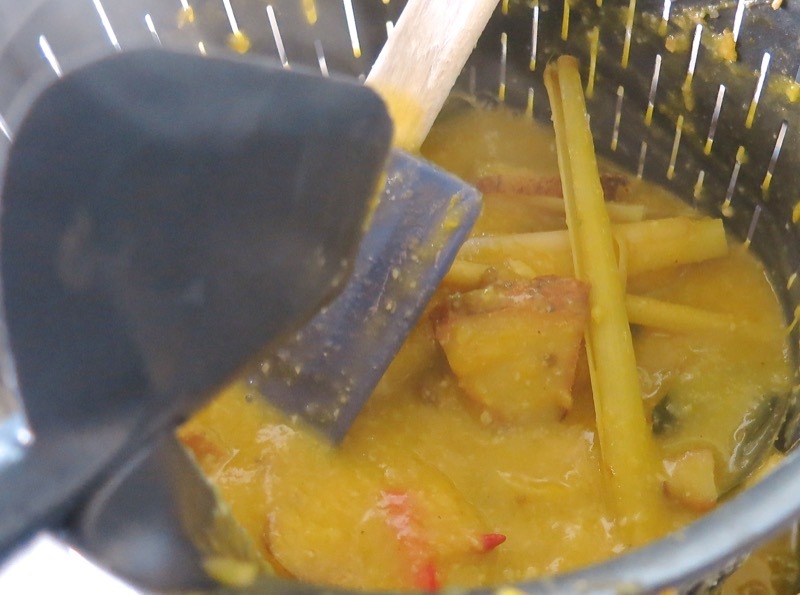 Using the spatula, the simmering basket is lifted so that the soup can be pressed through the simmering basket back in to the TM bowl with the remains of the Thai Flavour Pack left inside of the simmering basket to discard. 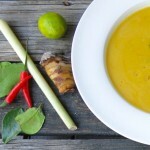 The coconut milk is added, the soup seasoned, and it is ready to serve! 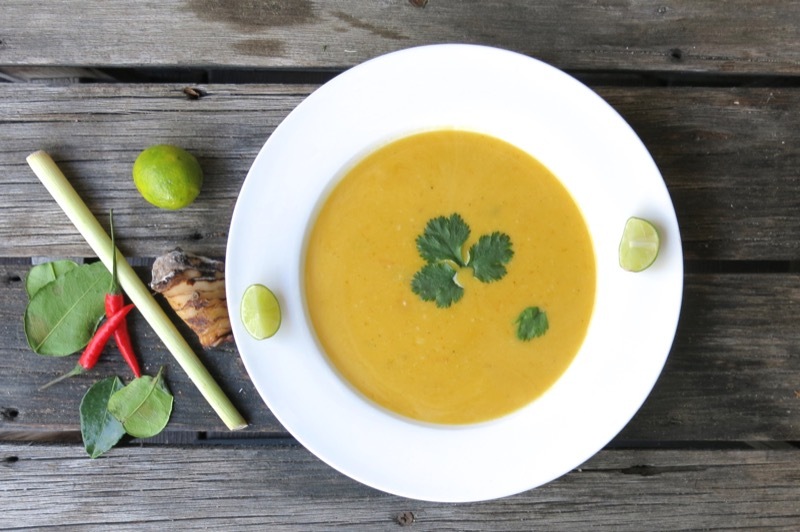 Garnished with cilantro and a squirt of fresh lime, this bowl of luscious golden goodness will warm you all over. Leaving the small textural granules of the once raw cashews, adds intrigue. The cilantro and lime brighten and lighten. I do recall my first bowl of Thai Soup. My friend Rae had some left over in her fridge. I have been addicted since, and that was 25 years ago. 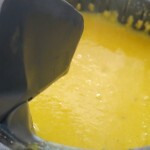 But, I have never found a recipe that brought me the irresistible pleasure that this recipe did. It is absolutely seductive. 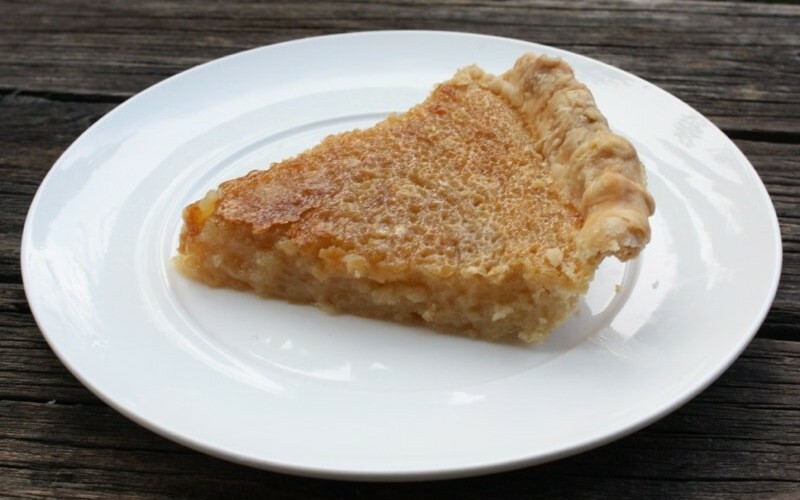 I sipped a cup of it for breakfast the next morning, savoring every drop, and I know this recipe has found its home at our house as it will definitely become a part of our family meal repertoire. If you make it, please chime in. If you like it, give the recipe 5 stars when you chime in. I want to hear from you. 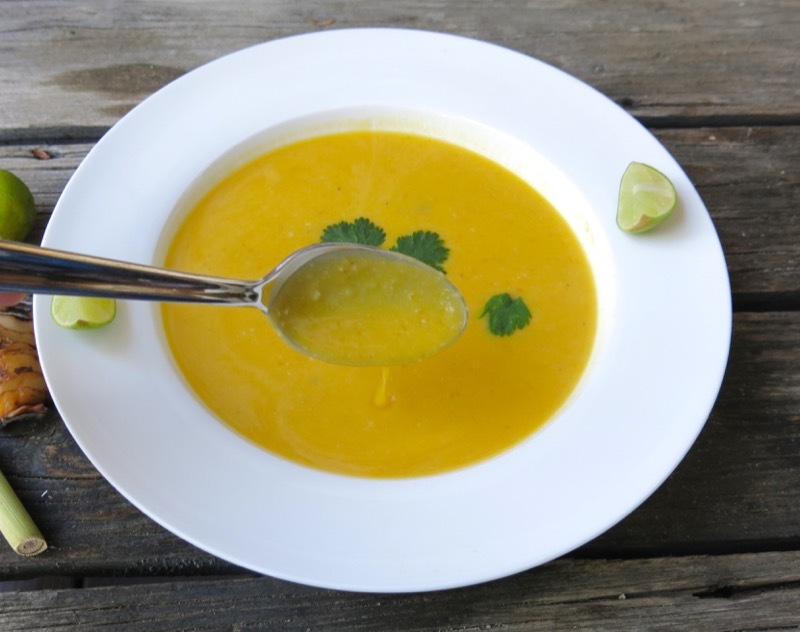 I am absolutely tickled as the additions are easy to add to this simple TM5 guided recipe and add a new and vibrant personality to a very quiet, somewhat shy, simple bowl of butternut squash soup. 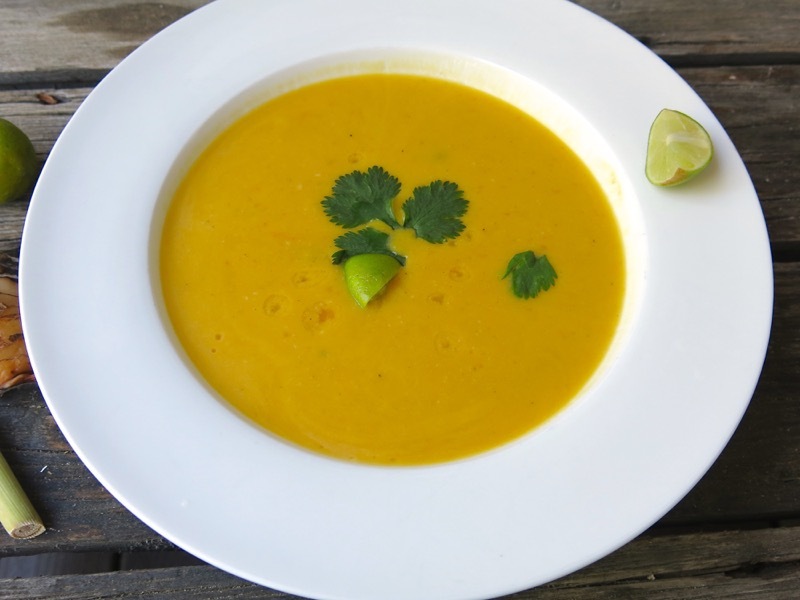 This is a really delicious, nutritious and economical soup that everyone in your family will love. Great job Valerie! Yes Jenny is really helpful when it comes to flavour.See you soon. And such a SIMPLE addition! Wonderful to hear from a passionate TM5 enthusiast in Germany! Sooooo glad you enjoyed the soup! I bet the dried galangal worked? 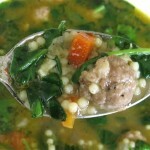 I know I have used dried kafir leaves in a pinch, and the soup was still delicious…. but the combination is so tasty, isn’t it. Addictive, to me! Thanks so much for chiming in, and if you come across any special German recipes for the TM5 that you love, I would so appreciate knowing. Love Matthias’s quark cake, for example. Valerie, the dried galangal was so hard, I suppose it is supposed to be that way, that I could not even grind it in my TM5. I added it to the basket and I suppose it added some flavor, but I don’t really know ????. I’ll make it again soon and make a comparison. 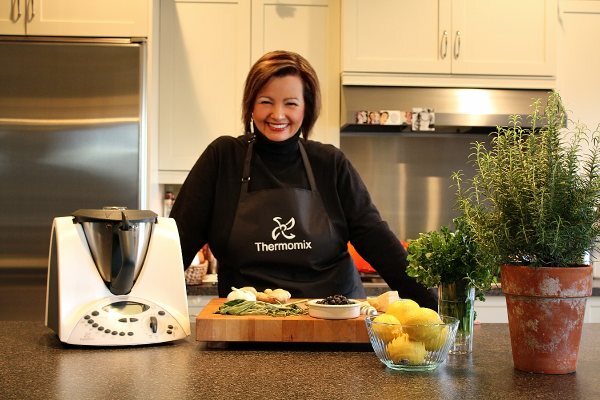 I’d be happy to translate any Thermomix recipe for you. Just let me know. ???? Really – well, if it was that hard, maybe it was petrified! HAHA! About the German recipes, I just don’t know. 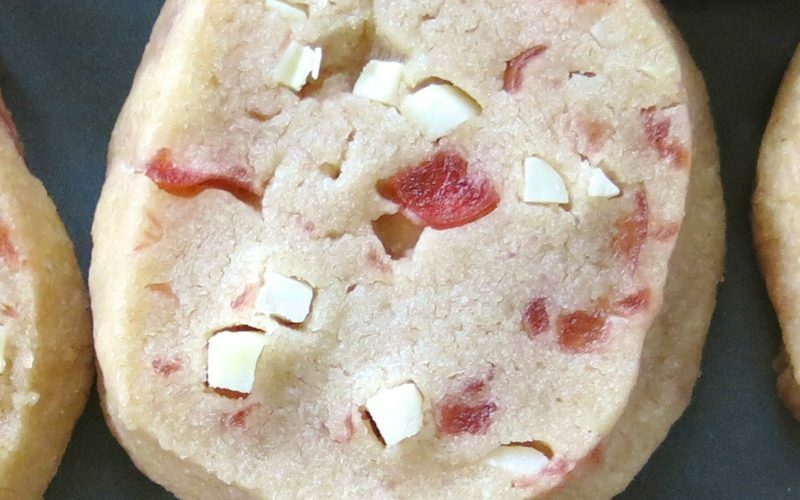 Like, I had never heard of Quark Cheesecake, and LOVE IT. And the Bread Matthias helped me learn to make is so phenomenal – the German brown bread. 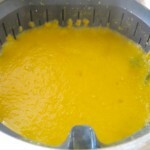 So, maybe, a recipe that you personally love and are triumphant about how wonderfully it is prepared in the Thermomix. If you have a recipe like that, I think that is the one I would love! 2 TBSP of apple cider vinegar. 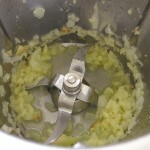 To begin, put the cube of fresh yeast in a small bowl, mash it with a fork and then sprinkle the salt over it. Mash further and right before your eyes, the yeast-salt combination will liquify! Set this aside. 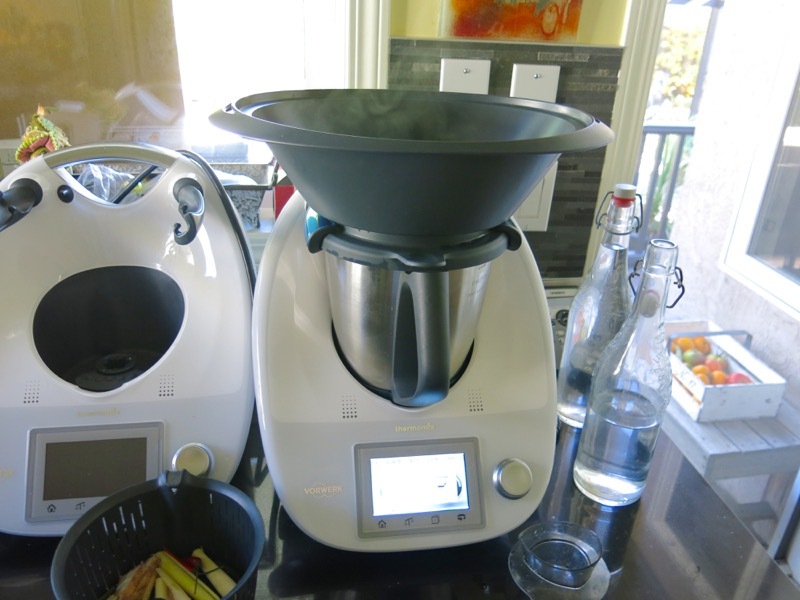 Grind 250 gm of spelt berries at speed 10 for about 1 minute, transfer to a bowl. Grind the other 250 gm the same way. When done, add the first batch of ground spelt berries back into the TM bowl. 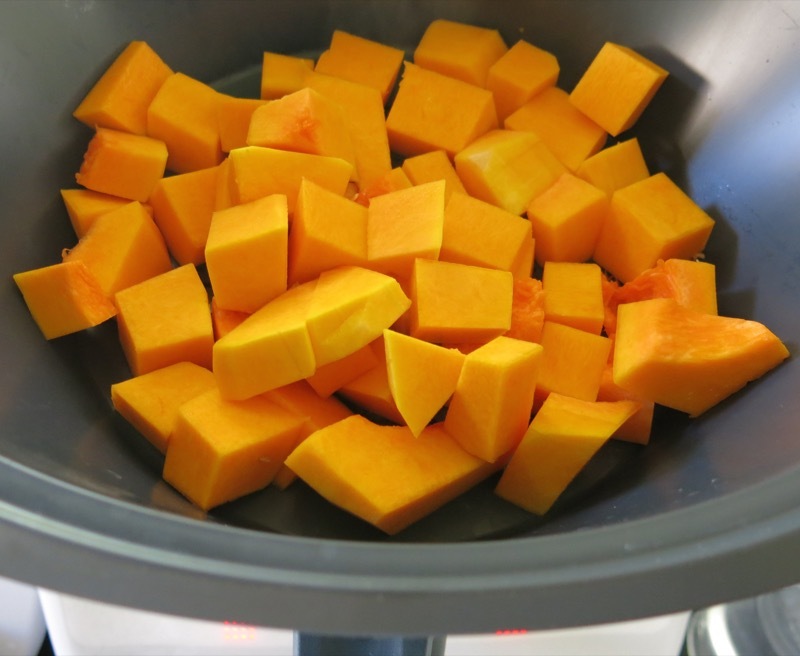 Weigh in the 150 gm of seeds, then add the rest of the ingredients. Knead ‘batter’ for 2.5 minutes then transfer this to a longish, pre-greased loaf pan (not the size one would use for a loaf of banana bread). This dough will be sticky and appear very wet to an experienced baker. I was skeptical but continued on with the recipe. Bake for about an hour. Allow to cool on a rack and enjoy!!! Let me know how you like it. 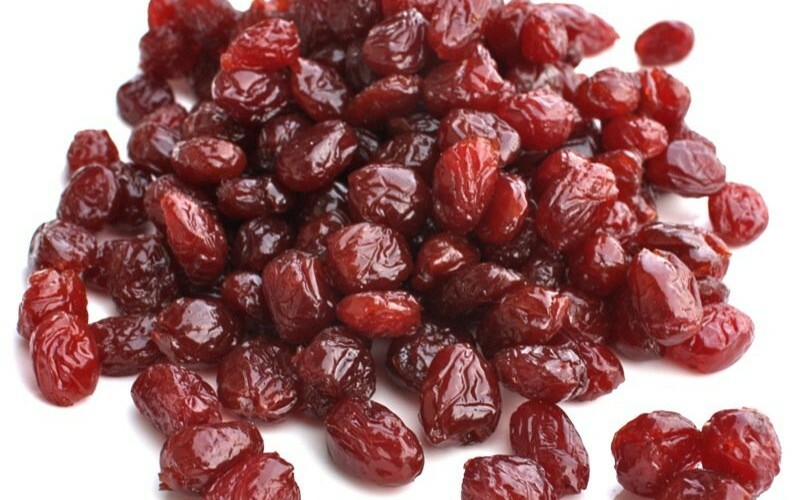 It is a very hearty bread whiich tastes great with nut butters or cheese. I LOVE this 5 minute spelt recipe! Thank you SO much! I cannot wait to try this. 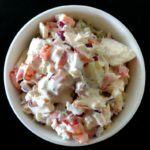 The most compelling part of your recipe is the salt and yeast together – as salt takes away the power of yeast when placed together – so I don’t understand how this recipe works! I will do more research – am heading to Salt Lake City to see my grandson (first birthday this week) for a couple of weeks – and then hope to make it when I get home!